Ring finger with mid-digital hair. Some people have hair on the back of the middle segment of some fingers. 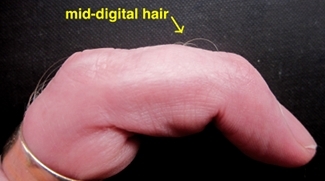 Individuals with hair on the middle segment of at least one finger are considered to have the trait mid-digital hair (H); other people have no mid-digital hair (N). Mid-digital hair is often used to illustrate basic genetics; the myth is that the presence or absence of mid-digital hair is controlled by a single gene with two alleles, and the allele for H is dominant. Several genetic studies show that this myth is not true. The population frequency of people with mid-digital hair ranges from 2 percent in Eskimos to about 75 percent in people of northern European ancestry (Saldanha and Guinsburg 1961). Danforth (1921) was the first to examine mid-digital hair as a character. (Garn  said "middle phalangeal hair" would be more accurate, as "mid-digital hair" implies hair on the middle finger; the scientific literature mostly uses his term, while genetics textbooks and web pages tend to use "mid-digital hair.") He pointed out the difficulties in scoring this trait: the hairs can be on all four fingers, or just one, and can range from numerous and thick to scarce and very fine. In some cases, hair follicles are present but no hairs are visible, which Danforth and most subsequent researchers counted as having hair present. Hair is most common on the ring finger, then the middle finger and pinkie; mid-digital hair is rare on the index finger. Bernstein and Burke (1942) reported that mid-digital hair was present in about half of females under 21, with a slightly higher percentage in males, but less than 20 percent of women over 21 had mid-digital hair. They suggested that housework wore away the mid-digital hair and hair follicles, which would complicate its use as a genetic trait. Ikoma (1973) surveyed the left hands of over 7,500 people in Japan. About 24 percent had at least one finger with mid-digital hair. The most common patterns were hair on just the ring finger or the ring finger and middle fingers, with middle, ring, and pinkie fingers being somewhat less common. Less than one percent of people had mid-digital hair on their index finger. Saldanha and Guinsburg (1961) reported that over 10 percent of a sample of Brazilians had mid-digital hair on one hand but not the other. Other studies (Danforth 1921, Bernstein and Burks 1942, Ikoma 1973) only looked at the left hand, so they would have classified some people as N who actually had mid-digital hair on their right hand. Danforth (1921) was the first to examine the genetic basis of mid-digital hair by comparing parents and offspring. Unfortunately, his sample of 80 families did not include any N x N matings. He concluded that his data were fairly consistent with H being dominant, but with some evidence that multiple genes or environmental factors influenced the trait. They suggested that H was dominant over N. If this were true, two N parents could not have a H child. Bernstein and Burks (1942) say the 20 H offspring of N x N matings could be explained if some of the "N" mothers were really H women whose mid-digital hair follicles had been worn away by housework. Unlike previous studies, these data show no genetic influence on mid-digital hair; about the same proportion of children have mid-digital hair for all three mating types. Sommer (1971) looked at the fingers of 28 pairs of identical twins, and found one pair in which one twin had mid-digital hair while the other twin did not. This is evidence that the trait is affected by the environment as well as genetics. Family studies show that mid-digital hair is not a simple genetic trait. It may be that the genetics of the trait are more complicated, or it may be that there is an environmental influence (such as hand work wearing away the hairs). In either case, you should not use mid-digital hair to demonstrate simple genetics. Beckman, L., and J.A. Böök. 1959. Distribution and inheritance of mid-digital hair in Sweden. Hereditas 45: 215-220. Bernstein, M.M., and B.S. Burke. 1942. The incidence and mendelian transmission of mid-digital hair in man. Journal of Heredity 33: 45-53. Danforth, C.H. 1921. Distribution of hair on the digits in man. American Journal of Physical Anthropology 4: 189-204. Garn, S.M. 1951. The use of middle-phalangeal hair in population studies. American Journal of Physical Anthropology 9: 325-334. Hindley, S.W., and A. Damon. 1973. Some genetic traits in Solomon Island populations. IV. Mid-phalangeal hair. American Journal of Physical Anthropology 39: 191-194. Ikoma, E. 1973. A genetic study on digital hair. Japanese Journal of Human Genetics 18: 259-273. Kloepfer, H.W. 1946. An investigation of 171 possible relationships in man. Annals of Eugenics. 13: 35-71. Saldanha, P.H., and S. Guinsburg. 1961. Distribution and inheritance of middle phalangeal hair in a white population of Sao Paulo, Brazil. Human Biology 33: 237-249. Sommer, K. 1971. Untersuchungen zur Genetik des Merkmals "Fingerbehaarung." Humangenetik 11: 155-168. This page was last revised December 8, 2011. Its address is http://udel.edu/~mcdonald/mythdigithair.html. It may be cited as pp. 51-53 in: McDonald, J.H. 2011. Myths of Human Genetics. Sparky House Publishing, Baltimore, Maryland.